In this last entry of the year, I wanted to share a piece of my own creative writing to say ciao to 2015. I’ve chosen “Art:History” from Anywhere But Here, my first book of poetry published this year by Sharktooth Press. 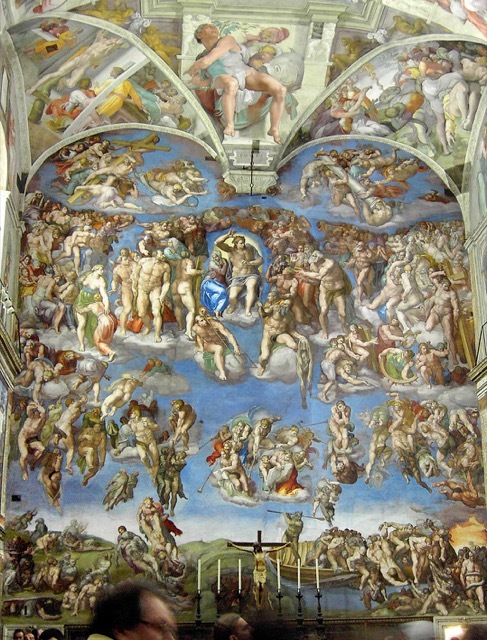 I was inspired to write the poem after studying the Sistine Chapel vault and the The Last Judgment, both envisioned and produced by Michelangelo. 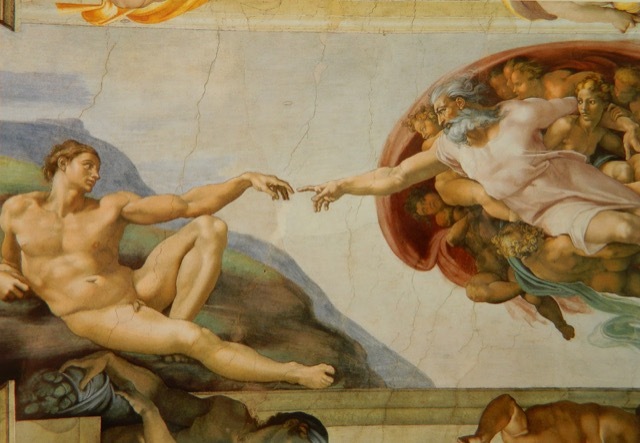 The idea for the poem came to me when I saw how differently Adam and Eve are perceived in the ceiling frescoes—God’s articulate finger pointing to Adam as the chosen one a sign. Michelangelo painted this fresco so beautifully, a section of the Sistine Chapel ceiling where God’s articulate finger points toward Adam. I wrote the poem 20 years ago and it has only been during the past year when I felt the pull to learn more about the artist, who actually considered himself a sculptor rather than a painter. I have owned a book of his sonnets for over a decade but I didn’t realize until recently that quite a few of his letters have survived. I was excited to find a selection of them bound into two slipcovered leather volumes at the Strand Book Store, which gave me great insight into his temperament. Not only are the books beautiful, they are comprehensive. 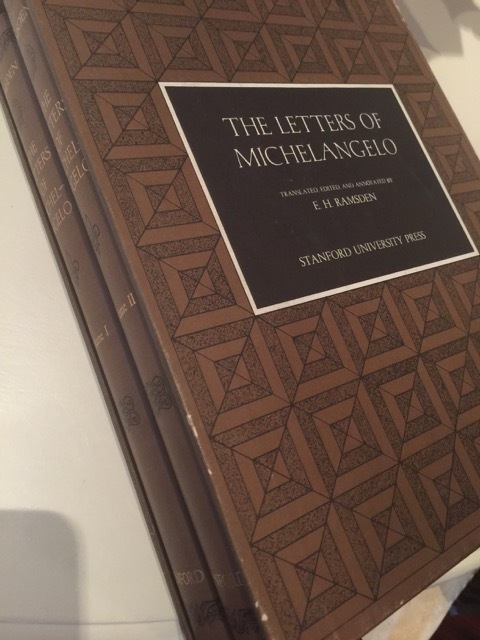 Published by Stanford University Press in 1963, the epistles were edited, annotated and translated “from the original Tuscan” by E. H. Ramsden. Volume One covers from 1496 to 1534, which includes the four years he worked on the vaulted ceiling (1508 to 1512); and Volume Two highlights the six years he was struggling to realize the altar wall—from December 1535 to December 1541. Ramsden assembled a timeline that highlights where the artist was living and what was happening in his life, details he juxtaposed against the projects he was undertaking at the time. 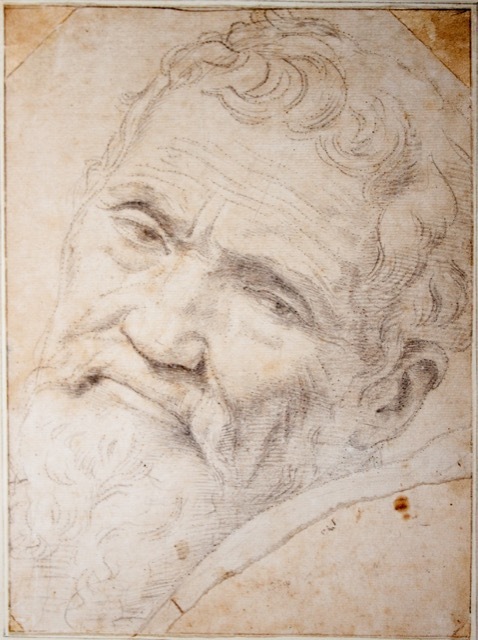 This sketch of Michelangelo highlights the artist’s down-and-out demeanor. This Michelango portrait is attributed to Daniele da Volterra. Image courtesy WikiMedia. The suffering evident in these letters, written by such a renowned man, prove that even the most lauded creatives seem to have doubt built into their DNA. You can actually see the angst in each of the portraits of him I’m including in this entry. 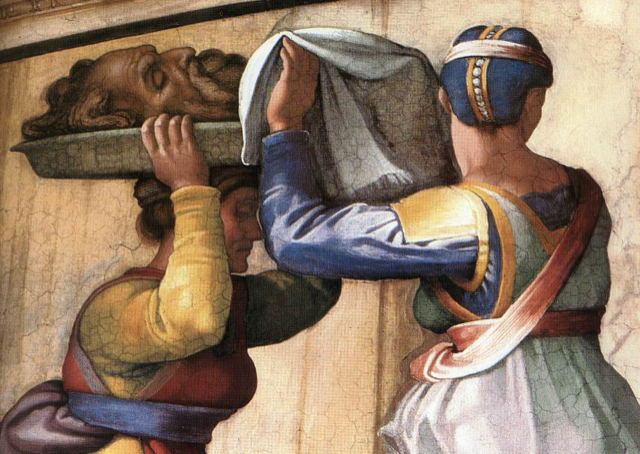 But Michelangelo’s pain was not solely existential. A large measure of his frustration stemmed from his father, who received the lion’s share of his missives during this period, the elder Buonarrota continuously lobbing requests for financial advice and support at his son. 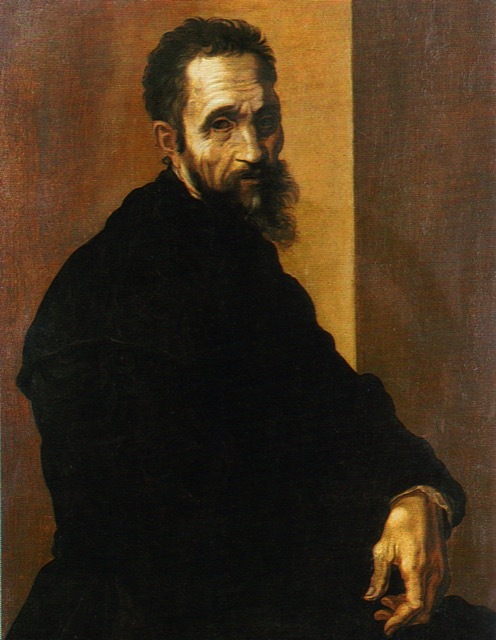 Portrait of Michelangelo at 60 by Jacopino del Conte, after 1535. Image courtesy WikiMedia. 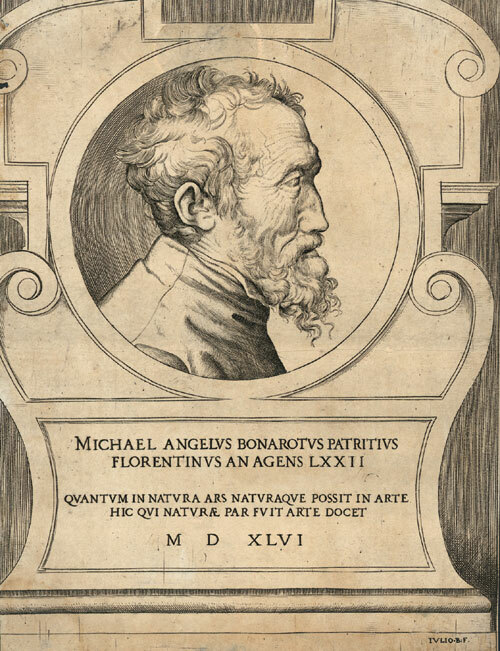 Portrait of Michelangelo Buonarroti at 72 by Giulio Bonasone, circa 1546. Image courtesy WikiMedia. 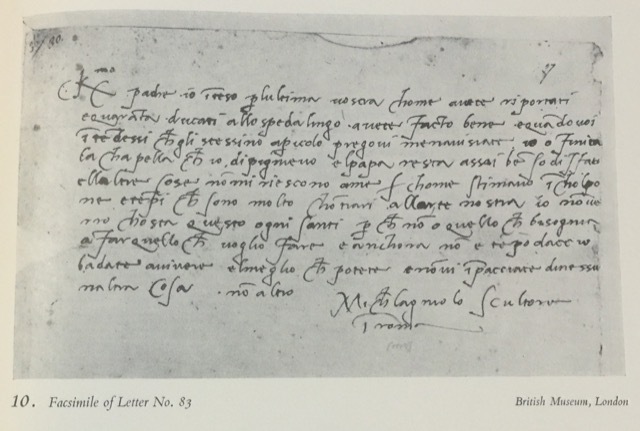 This is the letter Michelangelo writes to inform his father he has completed the ceiling of the Sistine Chapel. Courtesy the British Museum, London. 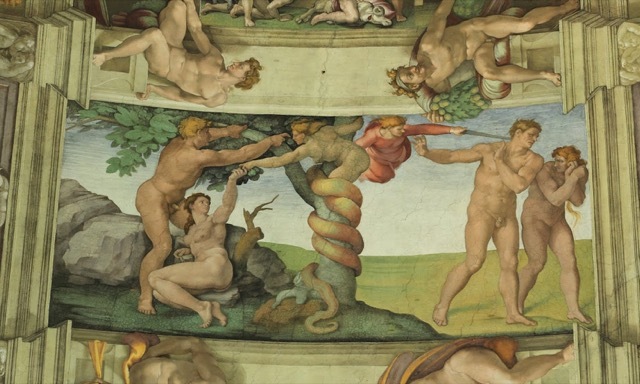 On Michelangelo’s Sistine Chapel ceiling, Eve participates in the Fall of Man. I’m actually glad I didn’t know as much about this brilliant but tortured artist before writing the poem because it would have been impossible to achieve the point of view I wanted to communicate, which was petulance toward religion, the clergy and a painter, all of whom perpetuated the idea that woman was to blame for a purported act perceived as one of the most negative events in religious history. 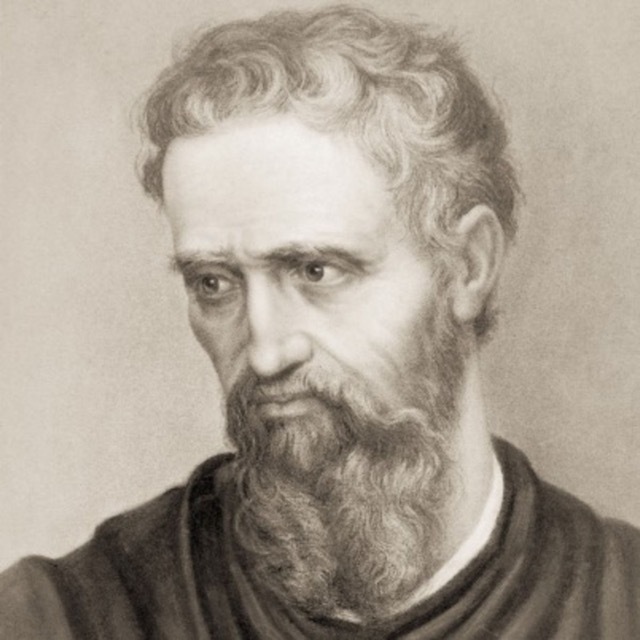 A self-portrait Michelangelo painted around 1510, his visage as the head of Holofernes in the Sistine Chapel ceiling. that the pavé diamonds will disguise your cross’s proclivity? while above her head she participates in The Fall of Man. toward the reach of God’s articulate finger. 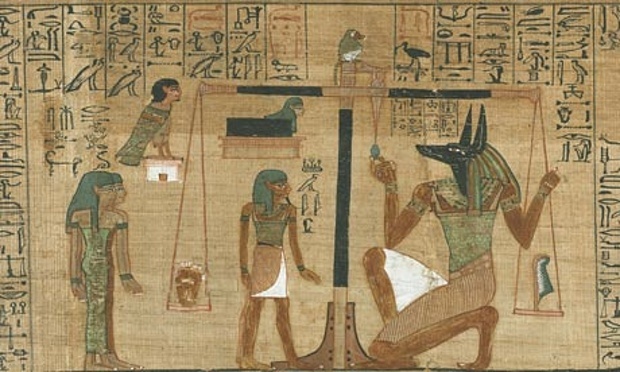 The jackal-headed god Anubis weighing a heart against the feather of truth. My most recent reading of Michelangelo’s letters made me wonder how it must have felt to be so involved with such an epic story depicting one of the most pivotal biblical myths while experiencing his own humanly feelings of debasement. He seemed even more beaten down by the time he painted The Last Judgment on the altar wall, even though he’d been appointed the supreme sculptor, painter and architect to the Vatican. This gave him more power and wealth as he took on the second project but the responsibility of the complex assignment combined with managing his family business from afar further wore him down. A few months before he completed this fresco, he fell from the scaffolding and severely injured his leg. He played it down in a letter to his nephew Lionardo di Buonarroti but his cynicism was growing: “And although Francesca isn’t very well, as she writes me, tell her from me that in this world one can’t be wholly fortunate, and that she must be patient.” He repeatedly asks his nephew to delay a visit to see him in Rome due to the pressure he is under in finishing The Last Judgment, a gurgling panic entering his tone. 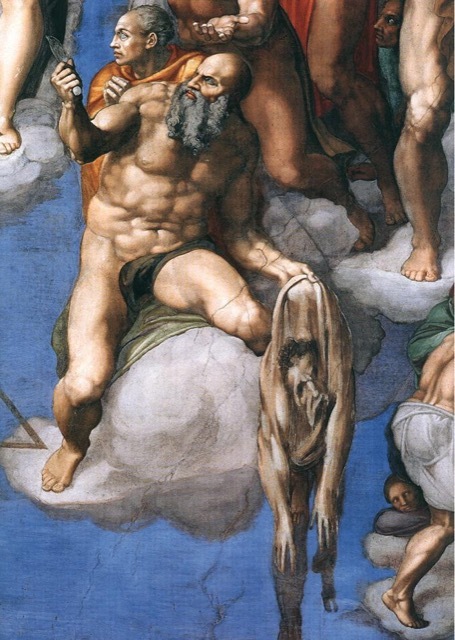 A self-portrait of Michelangelo as the flayed skin of St Bartholomew in The Last Judgment on the Altar Wall. Image courtesy WikiMedia. 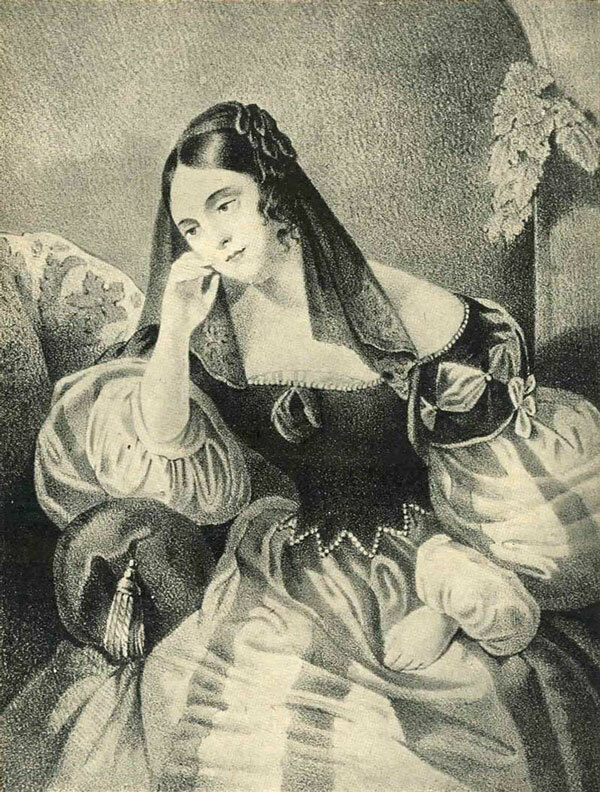 But something positive was blossoming in his life during this time—a relationship with Vittoria Colonna, a poet and the Marchesa di Pescara, which I will write about here on The Diary of an Improvateur in early 2016. In the spring of 1539, as he struggles to complete the complex fresco—still two and a half years from completion—he writes to her, “…I had desired to perform more for you than for anyone on earth I ever knew.” His passion spills forth in nearly every sentence he writes to her. I’ll share more of their story later so stay tuned! Vittoria Colonna in Rome in 1941. Though this post is weightier than I had intended, I am happy to end 2015 on a note of visual beauty as I close a year of aesthetically remarkable explorations. I will see you all back here in the New Year: let’s make it a mythic one, shall we? After all, each of us has a legacy to leave, just as Michelangelo did; hopefully, we won’t suffer as terribly as he did as we breathe life into ours! 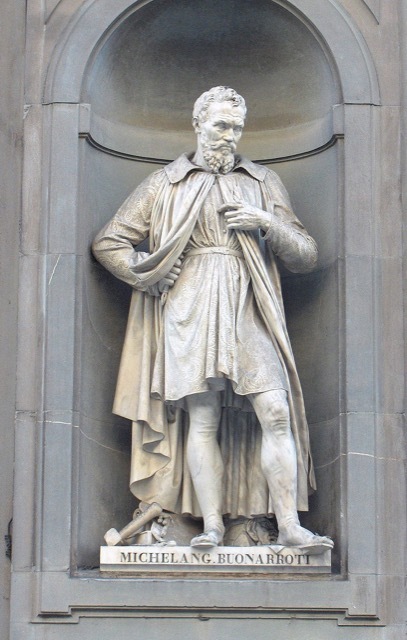 This statue of Michelangelo sits outside the Uffizi Gallery in Florence. Image courtesy WikiMedia. 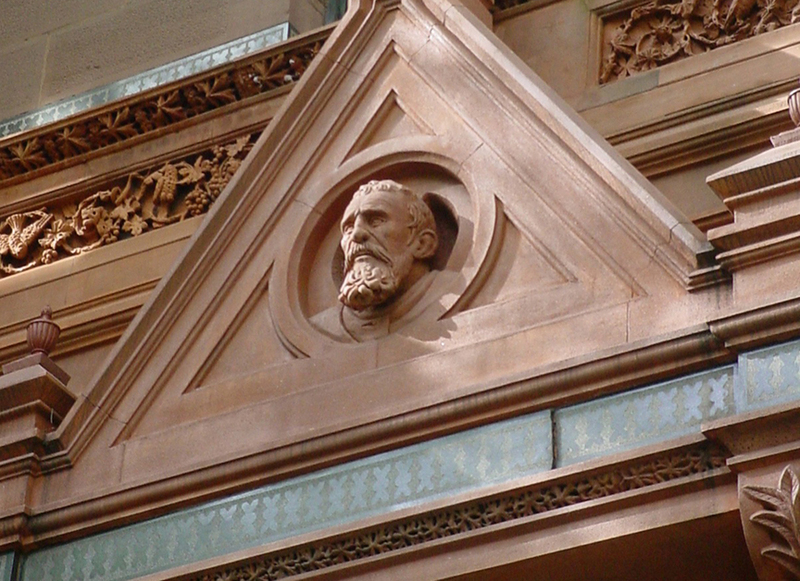 A statue like the one above and an homage like the one below gracing the façade of the National Arts Club in New York City where I will be staying next month, may be a bit too much to expect but that’s no reasons we shouldn’t take our efforts just as seriously. The Modern Salonnière and this entry, God’s Articulate Finger, © Saxon Henry, all rights reserved. Saxon is an author, poet and SEO strategist whose books include Anywhere But Here, Stranded on the Road to Promise and Four Florida Moderns.